Here are some snazzy birthday facts about 13th of August 1982 that no one tells you about. Don’t wait a minute longer and jump in using the content links below. Average read time of 10 minutes. Enjoy! What day was my birthday Aug 13, 1982? August 13, 1982 was a Friday and it was the 225th day of the year 1982. It was the 33rd Friday of that year. The next time you can reuse your old 1982 calendar will be in 2021. Both calendars will be exactly the same! This is assuming you are not interested in the dates for Easter and other irregular holidays that are based on a lunisolar calendar. There are 113 days left before your next birthday. You will be 37 years old when that day comes. There have been 13,401 days from the day you were born up to today. If you’ve been sleeping 8 hours daily since birth, then you have slept a total of 4,467 days or 12.23 years. You spent 33% of your life sleeping. Since night and day always follow each other, there were precisely 454 full moons after you were born up to this day. How many of them did you see? The next full moon that you can see will be on May 18 at 21:13:00 GMT – Saturday. Fun stat: Your first one billion seconds (1,000,000,000) happened sometime on April 21, 2014. If a dog named Zephyr - a Azawakh breed, was born on the same date as you then it will be 182 dog years old today. A dog’s first human year is equal to 15 dog years. Dogs age differently depending on breed and size. When you reach the age of 6 Zephyr will be 42 dog years old. From that point forward a medium-sized dog like Zephyr will age 4.5 dog years for every human year. John I becomes the new Pope after the death of Pope Hormisdas. Count Reginar I of Hainault rises against Zwentibold of Lotharingia and slays him near present-day Susteren. American Revolutionary War: The Royal Navy defeats the Penobscot Expedition with the most significant loss of United States naval forces prior to the attack on Pearl Harbor. Bayerische Motoren Werke AG (BMW) established as a public company in Germany. East Germany closes the border between the eastern and western sectors of Berlin to thwart its inhabitants’ attempts to escape to the West. What does my birthday August 13, 1982 mean? Your birthday numbers 8, 13, and 1982 reveal that your Life Path number is 5. It represents progress, adventure and opportunity. You possess the curiosity of a cat and long to experience all of life. The following celebrities also have the same life path number: Kim E-Z, Seamus Davey-Fitzpatrick, Philip Oakey, Gianna Rolandi, Jason Blaine, Anthony Fedorov, Camarón de la Isla, Dave Gahan, Katy de la Cruz, MK Nobilette. 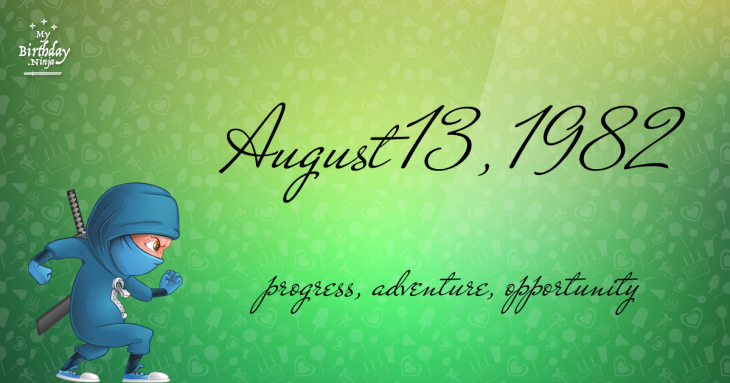 What is the birthday horoscope for Aug 13, 1982? The Western zodiac or sun sign of a person born on August 13 is Leo ♌ (The Lion) – a fixed sign with Fire as Western element. The ruling planet is Sun – the center of our universe. According to the ancient art of Chinese astrology (or Eastern zodiac), Dog is the mythical animal and Water is the Eastern element of a person born on August 13, 1982. Fun fact: The birth flower for 13th August 1982 is Poppy for preparedness. The number-one hit song in the U.S. at the day of your birth was Eye of the Tiger by Survivor as compiled by Billboard Hot 100 (August 14, 1982). Ask your parents if they know this popular song. I do not know how you feel about this, but you were a female ♀ in your last earthly incarnation. You were born somewhere around the territory of Yukon approximately on 1275. Your profession was preacher, publisher, scribbler of ancient inscriptions. How many babies were born on August 13, 1982? Base on the data published by the United Nations Population Division, an estimated 129,217,304 babies were born throughout the world in the year 1982. The estimated number of babies born on 13th August 1982 is 354,020. That’s equivalent to 246 babies every minute. Try to imagine if all of them are crying at the same time. What is the popular baby name on 13 Aug 1982? Here’s a quick list of all the fun birthday facts about August 13, 1982. Celebrities, famous birthdays, historical events, and past life were excluded. 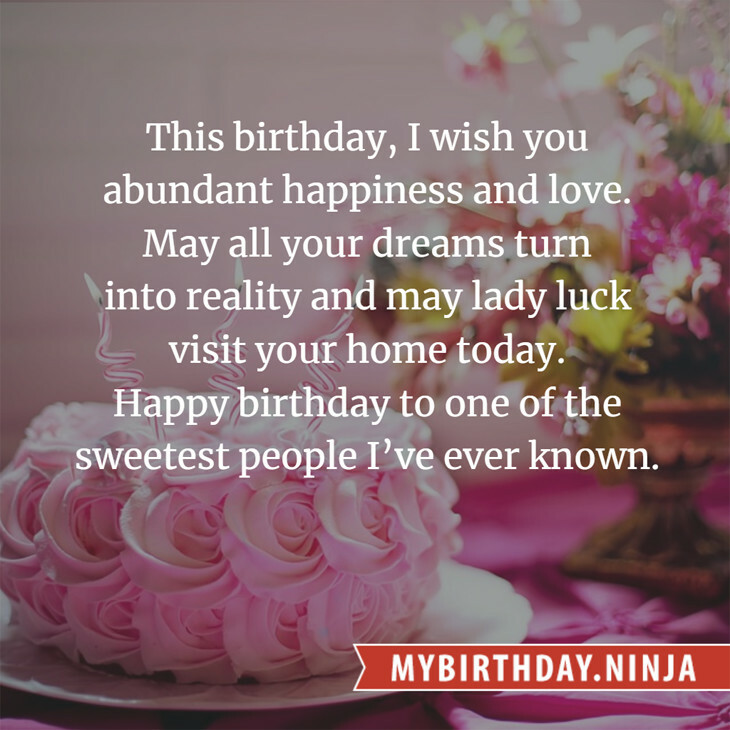 Try another birth date of someone you know or try the birthday of these celebrities: November 26, 1971 – Winky Wright, American boxer and actor; June 28, 1964 – DJ Quicksilver, Turkish-German DJ and producer; March 1, 1934 – Joan Hackett, American actress (d. 1983).